Without it being the intention, this double page spread in Ben and Le-Anne's wedding album is an example to photographers and non-photographers alike on how zoom lenses work, and that there's no right or wrong lens for wedding photography, you can always make the most of what you have. 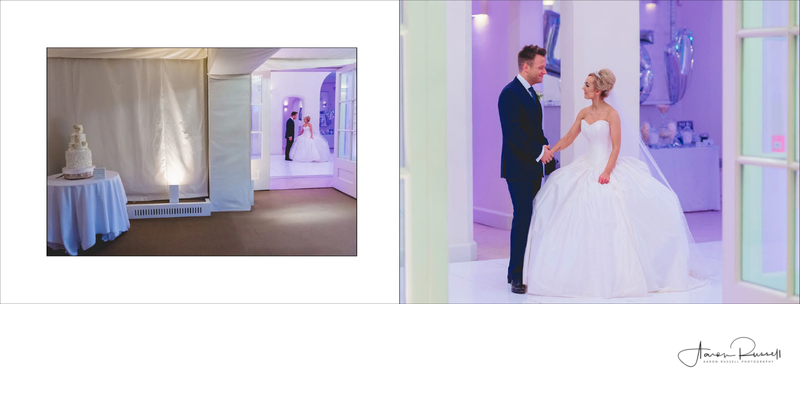 On the left is a relatively wide angle photo that I took in order to show the bride and groom sharing an intimate moment, whilst zooming out to set the scene - showing the bride and groom where they are in relation to other aspects of their wedding venue. Here I've zoomed out just enough to show how the cake was positioned relative to where the couple were going to be announced into the room for the first time as husband and wife. The image on the right page was taken fully zoomed in, this time showing off the wonderful moment between the newlyweds, with the long focal length removing any other distractions from the image. For me, this image works really well as I love the colours in the background of the image. The mood lighting was provided by the DJ and bathed the room in a lovely purple glow that contrasted well with both the bride's white wedding dress and the groom's black suit.